Hurray! Today is the WONDERFUL day that you can find two ADORABLE new Stamp Sets and coordinating Sweet Cuts (dies) available for sale in the Paper Sweeties Shop! These two sweet new sets are just in time to help you get some sweet Christmas cards, tags, and projects together. How sweet is this? 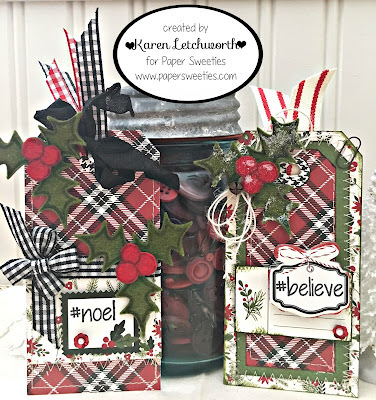 I created this sweet tag using the Meet Me Under The Mistletoe Stamp Set and coordinating Meet Me Under The Mistletoe Sweet Cuts to create a wool felt holly and berries accent that I glittered a bit. Once I had laid and machine stitched my patterned papers, I added the wool felt accent and topped it with a tiny rusty bell and some ivory burlap string. 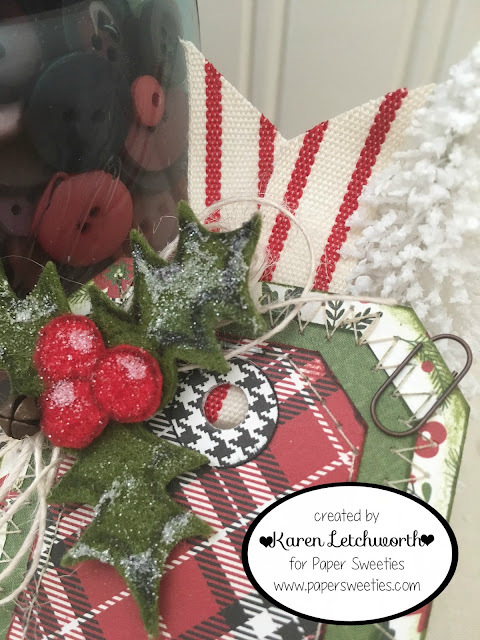 I love the rusty metal accents with the soft sweet holly and berries found in the new Meet Me Under The Mistletoe Stamp Set. The touches of soft and hard compliment one another, and Paper Sweeties has so many lovely stamps to help you find the just right balance of sweetness with your own edge. No matter what your crafting style, there's always something new to be found to help you create something amazing; and Paper Sweeties wants to help you do just that! As I know I've mentioned before (more than once...LOL), I absolutely LOVE the hashtag #sentiments you can find in many of the newer stamp sets at Paper Sweeties. Using hashtags is very on-trend and a fun way to incorporate using Instagram in your crafting. I'm still learning the whole #hashtag thing, but I sure do LOVE the sweet #hashtag stamps! 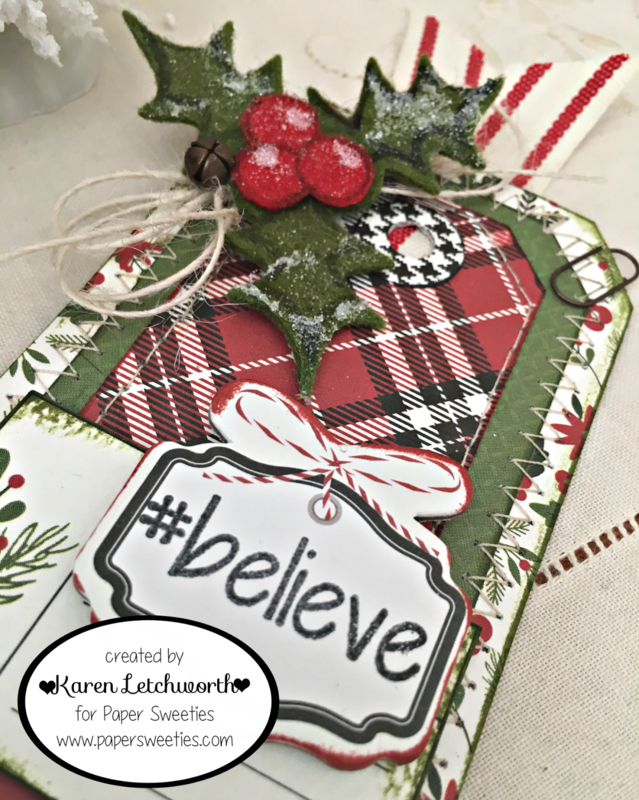 This one (#believe) is from the new You Better Not Pout Stamp Set. Isn't it adorable? My final tag photo (above) also includes the tag I created for the 25 Days of Christmas Tags on the day Paper Sweeties was participating. 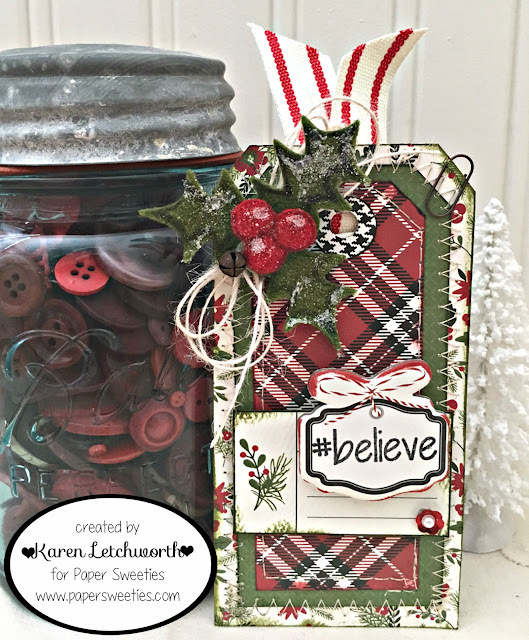 But just in case you missed it, this tag uses a #hashtag stamp from the new You Better Not Pout Stamp Set, some Licorice Seam Binding, and I added Strawberry Sequins to accent both tags. My card today uses all the same patterned papers, but also incorporates the awesome new Meet Me Under The Mistletoe Stamp Set, the holly and berries cut from patterned paper using the Meet Me Under The Mistletoe Sweet Cuts, and two of the sentiments from the You Better Not Pout Stamp Set. There's also a sweet bow tied with Licorice Seam Binding and Frosting Seam Binding, and I accented my card with Sugar Sprinkles Sequins and Strawberry Sequins. 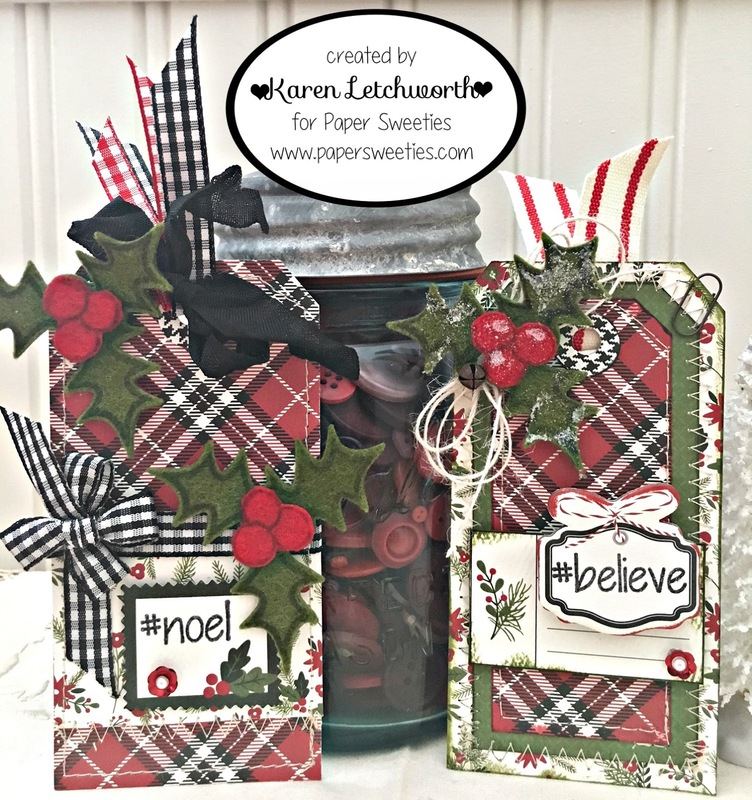 25 Days of Christmas Tags - This tag I'm sharing today was inspired by my own tag that I shared on Day 9 for Paper Sweeties. I love using the plaid and holly berries. Once I started using these fabulous products, I simply couldn't stop! Simon Says Stamp - Monday Challenge - Simon Says "It's a Stitch Up" - I enjoy stitching on almost all of my projects, so this challenge was right up my alley. You can see all my machine stitching. LOVE it! Dies R Us - Challenge #85 - SNOW - I added ultra-fine white glitter to my holly and berries to make it look like it's dusted with snow. Karen, your tags and card are just gorgeous. You are really doing such beautiful tags and such an inspiration. Great release. Both of your tags are gorgeous, Karen, and so is your card! I love the warm look of the felt and the wonderful rich plaid! Thank you so much for your kind words today on my blog - great minds think alike! 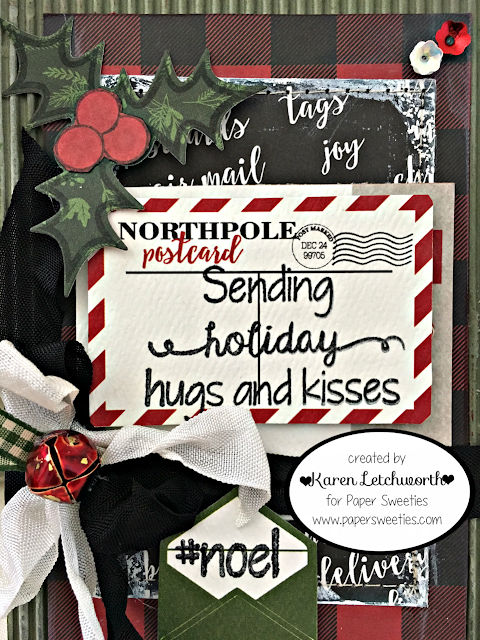 Love your gorgeous tags & cards! Perfect for Christmas giving and sure to be treasured! Thanks for joining our "Snow" challenge at Dies R Us! The stitching, and pattern papers, and every gorgeous embellishment combine to make wonderful little Christmas tags... happy to see them in the 25 Days gallery! Wow, what a GORGEOUS tag!! I love the awesome layers and wonderful design! Oh Karen these tags are just beautiful ... so festive! Great job! Thanks so much for playing in our ‘SNOW’ challenge at Dies R Us! Please come back again soon! 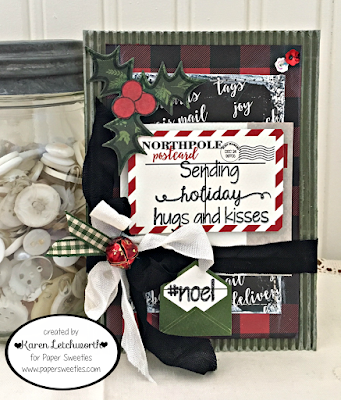 Gorgeous tags and card, Karen!! Love you dressed up the holly...so pretty!! Gorgeous bow treatment, too!! Beautiful tags & just perfect for attaching to a special gift! Thanks for joining our "Snow" challenge at Dies R Us! SO super cute, Karen. The glitter dusting make your leaves and berries look snowed upon. SO pretty!